First we saw a cat vs mountain lion face off and now it’s the turn of a black bear to challenge a domestic pet. The result is pretty much the same. 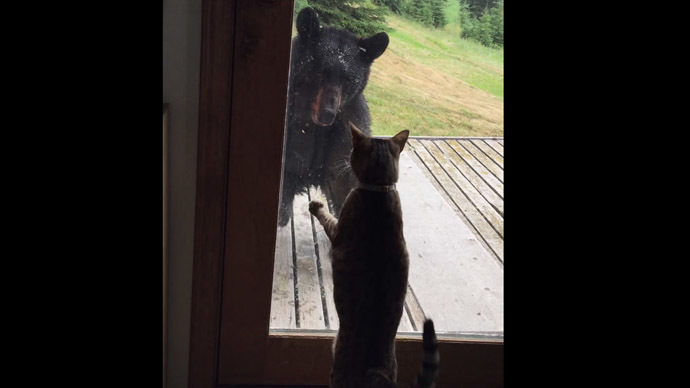 A resolute two-year-old house cat called Nani managed to scare a black bear off her family porch, with the owner filming the stand-off. "The bear came up our front drive way and walked around the house to the back," Darlis Elliott, a resident of Eagle River, Alaska, told local broadcaster KTUU. "We were all kind of watching him as he came up the back porch and that's when Nani saw him." The feline crouched in front of the door, stalking the intruder, Elliott said. "She was watching him until he turned his face to the door, and that's when she pounced. We were all really surprised that she lunged at him, but we were more surprised that it scared him enough to fall of the porch," he said. “She’s really such a fraidy cat most of the time, I don’t know what got into her,” he added. The bear hasn’t been seen since, Elliott said.